Harold Scruby of Ausflag briefs the other judges. 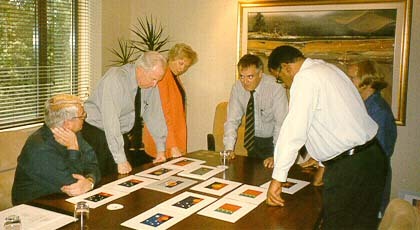 The judging of the Australian Flag - Professional Design Competition was conducted at the Sheraton on the Park Hotel on Monday 27 October 1997. The judging proceeded with each and every design being displayed for discussion and selection or rejection. Where all judges agreed, the design was either accepted or rejected. Where one judge or more said the opposite to the majority the design was further discussed. When in doubt the design was included for further consideration. In the first round, approximately 250 designs were selected, including some similar designs. These designs were then displayed in groups so the judges could consider them more easily. A process of elimination then took place to select the best designs of each group and representative designs of each type or concept. This round reduced the choices to approximately 150 designs. Then a more formal scoring and ranking procedure was used in the final round to determine the 100 finalists. It was evident that many designs had similar elements, similar colours and themes of Southern Cross, stars, landscapes and indigenous markings and so on. The judges were at pains to select the best of these designs in terms of colour use, proportion, impact and simplicity. Where questions of vexillology or protocol or heraldry arose debate took place and the expert opinion of the Flag Society of Australia was bought to bear. The judging was harmonious and unanimous. Judges were impressed by the high level of compliance with the brief and the understanding of what a flag is. This would seem to justify the effort put into the Design Brief. The designs were generally very professional and well presented. There was a wide range of ideas representing both traditional designs and new design concepts. It was interesting to see the idea of landscape included in many designs ? This would seem to speak for the Australian love of the outback and the earth. A substantial number of designers included elements of the Aboriginal flag with other emblems. This was an encouraging concept and spoke well of the status this flag has achieved. A number of the finalist designs introduced original earth colours and indigenous themes. The frequent use of black either as a main field or section of a flag was noted with interest. Only a comparatively small number of designs favoured green and yellow (gold) as the main colour scheme. Most entries favoured blue as a main colour. Red was also popular as an element colour, as was yellow or gold. The most popular symbol was the Southern Cross. The Federation Star of seven points was a very popular choice with an eight point star beginning to make and appearance. Other symbols favoured in lesser number were Uluru (Ayers Rock), wattle and the kangaroo. The map of Australia was not a popular image. A few designs included elements of the Union Jack. A few designs were based on the Eureka flag. Several designs replaced the Union Jack in the corner of the present flag with the Aboriginal Flag. They were considered neither original, nor appropriate as Aboriginal leaders have already indicated that they would not endorse such a design. Other designers sought to apply the Aboriginal Flag with other themes. 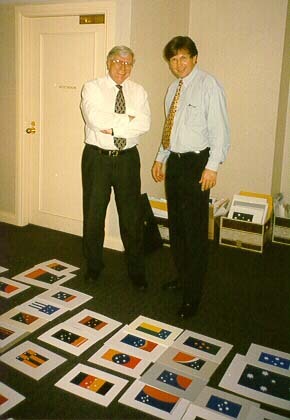 Chris Finn (L) and Harold Scruby (R) with some of the designs. Chris Finn is from the Sydney Cove Law Group and is a specialist copyright lawyer who received all the entries. Chris Finn is the only person who has a record associating entries with the names of the entrants. The judges agreed that the competition had had an excellent response and had produced worthwhile results. The 100 designs selected should provide the public with much food for thought and inspiration. The top 20 designs, as voted by the public, were announced on 26 January, 1999. The top 10 designs, as chosen by the Assessment Panel, were announced on 1 May 1999. The Assessment Panel contacted these designers and made a final choice as to the best designs. 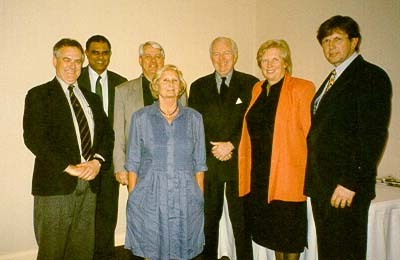 The overall winners were announced on Australia Day, 26 January, 2000. To ensure completely transparent judging, the names of the 100 finalists remained strictly confidential, and the names of the overall winners were released only after the final judging was completed. "The response to this competition would seem to favour the strong desire of many designers to have a unique symbol of our own which is not derivative of another culture or nation. "There is evidence of a general wish to have a link with the past - a sense of continuity. Perhaps 100 years of (flag) history have influenced most competitors but some new and exciting ways of incorporating our national symbols seems to be emerging." The Designs were exhibited at the Museum of Sydney and the Art Gallery of Western Australia from Australia Day 1998. The Exhibition then travelled around Australia and was displayed at distinguished venues, finishing in Melbourne in December 1998.